Several University of California labor groups gathered in Price Center on Feb. 14 at 11 a.m. for a Valentine’s Day “Teach-In” to spread awareness about ongoing disputes between the UCOP and various labor groups. The teach-in was organized by the UC San Diego Labor Commission and the organization United States Against Sweatshops. At the teach-in were several other labor groups, such as University Professional and Technical Employees, UC-American Federation of Teachers, The American Federation of State, County and Municipal Employees, and the newly formed UCSD Solidarity Coalition, which aims to support other organizations and populations from mistreatment by the University of California. The teach-in was part of the Labor Commission’s Workers Appreciation Week, which consisted of tabling and making appreciation-grams for UC workers. The Valentine’s Day holiday was used as an opportunity to speak about numerous issues UC laborers face, including health care, labor contracts, the UC-AFT wage gap, and issues regarding academic freedom. “The labor of our campus workers goes constantly unrecognized by many on our campus, so we wanted to use Valentine’s Day as a way to uplift their work and their love by showing some for them,” Prajay Lolabattu, a UC Labor Commission member and AFSCME student representative, said. AFSCME members have been bargaining for a fair contract with the UC Office of the President for two years and are currently working without one. “Despite two strikes and two years out of contract, there has been no action from the UC [office] to make an offer that respects their dignity and adequately supports their livelihoods and those of their families,” Lolabattu added. UCSD Digital Initiative Librarian and UC-AFT Unit 17 member Cristela Garcia-Spitz spoke at the teach-in about the contract bargaining sessions between UCOP and UC-AFT, as well as the wage gap between UC librarians and their counterparts at other universities. The Comparison-8 is a list of four public and four private universities that UCOP uses to compare the salaries of librarians and other faculties. UPTE serves the interests of UC’s front-line workers, which include patient-care tech personnel, janitors, and pharmacists. UPTE Recording Secretary Susan Orlofsky called for student support in opposing UC Regent George Kieffer’s privatization conflict of interest between his law firm’s client Fidelity and the UC Pension Plan. Orlofsky also spoke of the University of California’s privatization of labor in an effort to save money on benefits. “They’re building a new rehab hospital at UC Davis, but they’re not hiring UC workers. They’re going to hire contract employees so that they don’t have to give them benefits,” Orlofsky said. During the teach-in, Lolabattu and co-organizer Samantha Munoz addressed several demands that were put out from students across California within the last month. 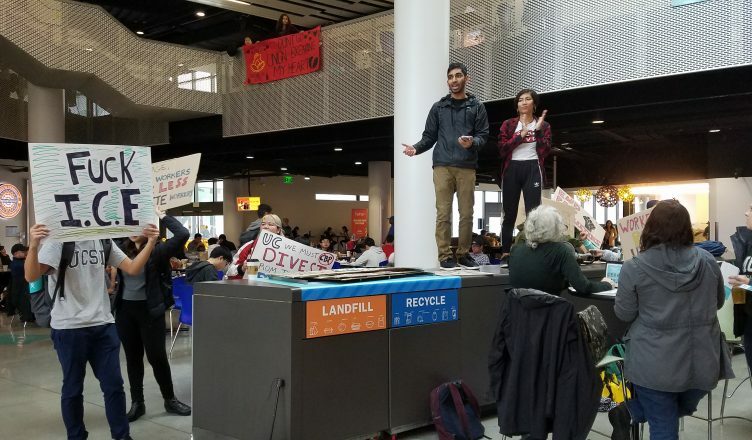 “To this day, the chancellor and administration of UCSD and the UC system as a whole have not done anything to take action to these demands,” Lolabattu said. One of the demands was the call for divestment from Immigration and Customs Enforcement and deportation. Munoz also addressed the student demand for the University of California to divest from violence in Palestine. “Thousands of Palestinians have died compared to the very few who are part of the Israeli military, and we really want them to install support for the Palestinians, especially the fact that our tuition money is going into the violence that is happening everyday,” she said. Another student issue addressed was the University of California’s deployment of police to student and worker demonstrations. “Security was actually called yesterday; they just didn’t get there in time,” Lolabattu said the day after the teach-in. UC-AFT Librarians and other labor unions will be bargaining with UCOP over a fairer contract and academic freedom on March 4 at noon in front of Geisel Library.